About the workshop leader: Graham Palmer is a member of the National Association of Writers in Education (NAWE) who has published three books with CUP. He is currently working on a historical biography and a sequence of poems which will form the basis of a new song-cycle, Cracked Voices, with local composer Jenni Pinnock. *This workshop may also prove useful to those preparing for the Creative Writing element in the GCSE English exam. This entry was posted in Blog, News and tagged Cracked Voices, creative royston, everything changes, Graham Palmer, NAWE, royston arts festival, royston museum, writing workshop on August 12, 2017 by Graham Palmer. Royston Heath is a riddle. This strangely-shaped piece of wasteland stretches east to west over the OS Map like a sleek cat stalking a stray town-rat. On the ground it seems huge but, from its eager head to the tip of its tail, it measures just 21/2 miles. If you’re lucky enough to view it from the front seat of one of the biplanes that regularly buzz Royston from nearby Duxford, the heath looks tiny. Though the cat nuzzles up close to the town, a parish boundary means this is Therfield – not Royston – Heath. A century ago the Victoria County History (1912) proclaimed it the ‘recreation ground of the town’. Look a little closer and you will discover something far more intriguing. Not that that matters to most people who (like my friend Peggy) come out every day to walk their dogs, support the footballers or rugby team, fly kites with their kids, go jogging or toboggan down the hills, slicing through winter snow. 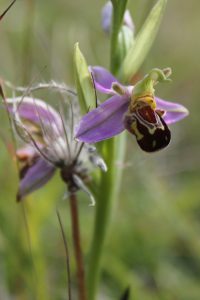 English Heritage says the Heath is ‘one of the best surviving prehistoric landscapes in the region’ and Natural England that this small plot of land nurtures ‘some of the richest chalk grassland in England’. It is the last tattered remnant of an open heath that bordered the ancient Icknield Way and was littered with hundreds of prehistoric burial mounds (now ploughed out), a borderland where the chalk hills rose up and, at Royston, confronted the low marsh of Bassingbourn Fen. When so much historic and ecologically important heathland has vanished, how on earth has Therfield Heath survived? To answer that riddle you must go back to the time of the Anglo-Saxon invasion. These incomers held everything they seized (including the former inhabitants) as common property and soon established vills across the country. Land was not ‘owned’ as we understand the word, but the householders were granted rights to use it. In return, they were expected to fulfil communal duties (house-building, service in the militia etc) and support the king’s court with food rent. Disputes were settled by custom or consensus at a moot (village meeting) and the village granted each householder a house, kitchen garden and strips to cultivate in the shared open fields. At ðereuelde the open field was portioned into named ‘shots’ (from the Old English sciat, meaning a nook or corner) and these were divided further into strips. 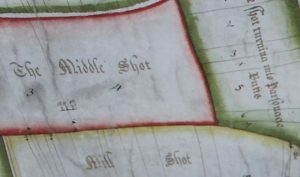 A huge and beautifully drawn map of the Therfield Common Field (1725) shows that many of these Anglo-Saxon shots survived for centuries and lists their intriguing names: Cats Holes, Claw Buck Shot, Chalky Dane Hill, Tumbelow Shot and over a hundred more. The map’s most noticeable feature is a very large splat of bright green paint, indicating the open grazing land that is now the Heath. The idea of land ownership only developed over the next five hundred years as Anglo-Saxon kings passed their right of local food-rent to the new monasteries and abbeys which grew up with the conversion of the country by Christian missionaries. This accumulation of wealth did not go unnoticed by the Vikings and led to many bloody clashes, culminating in the eleventh century with an invasion from Scandinavia that put the Danish Cnut on the English throne. Much further north, on a island in the marshes at Ramsey, an abbey had been established. In the same year that the abbey church was completed (974) a terrible earthquake shook England, bringing down houses. The quake – or simple subsidence – weakened the building and within ten years major cracks appeared. After much soul-searching, the monks were forced to tear down the church’s central tower and rebuild it. Fortunately, the problem did not affect the church’s west tower which housed a light that guided people in across the marsh and the bells that signalled the changing Holy Hours and were believed to echo God’s voice. The abbey’s monks lived their lives according to St Benedict’s strict rule which emphasised stability, conversion of manners, and obedience. Boys from respected families were taken in and educated there but it was difficult for some to adjust to the ways of the cloister. The Chronicon Abbatiae Rameseiensis (The Ramsey Abbey Chronicle) records how one boy proved a particular challenge. Etheric was still young when sent to Ramsey and he and three playmates – Athelstan, Eadnoth and Oswald – soon fell foul of the abbey’s rules. One day they got it into their heads to sneak up the west tower. Who touched a bell rope first? When the bell rang out there was no way back. Egging each other on, the boys became more and more exuberant. The Danish settler was not very comfortable in his possession. In fact, he was in fear of his life. There were bandits in the area and villagers had taken so badly to his ways that the Dane could not sleep unless four men were standing guard nearby. The Ramsey Abbey Chronicle tells how, one night, he overheard his guards plotting to kill him. If they could not hand him over to the bandits, they swore they would relieve the village of his abominable existence by sticking a knife in his bowels. A later portrait of Cnut the Great. That night the terrified settler crept away to the safety of his a friend’s nearby vill. Punishing the guards was not an option as the villagers would retaliate and it would be impossible for one man to evict a whole village. The Dane had no choice but to make his way to London to consult the king. In the meantime, Etheric’s local agent (apparently based at Ashwell) got word to him about the trouble and Etheric, who was in London, persuaded both Cnut and the settler that the land was worthless while the villagers were in rebellion. The obvious face-saving solution would be for Etheric to buy the land (at a knock-down price) as a gift for the Abbey at Ramsey in recompense for a broken bell. Therfield (and its heath) remained with the monks at Ramsey right up until the mid-sixteenth century when Henry VIII dissolved the Abbey and seized all its lands. The manor passed briefly to Katherine Howard as part of her marriage settlement but within thirteen months she had been beheaded and it reverted to the king. Two years later he exchanged it for lands held in Essex and Middlesex by the Dean and Chapter of St. Paul’s and for the next four hundred years the Church of England held Therfield in its possession. Enclosure came to the open fields in the mid-nineteenth century but the green splurge on the 1725 map was retained as common grazing, the site of Royston town gatherings, celebrations, fairs and the occasional prize fight. The management of the heath – with its various petty disputes – proved increasingly troublesome to the Church Commissioners who felt ownership should pass to a body more in tune with local needs. By the 1890s a body of trustees (or Conservators) made up of Royston rate-payers and wealthy local land-owners, who retained rights to graze their sheep, took control of the Greens of Therfield and its Heath. ‘The Award’ also enabled John Francis Fordham of Thrift Farm to exchange an isolated patch of land he owned in the centre of Therfield to create a playing field in return for which he got the part of the Heath between his farm and what is now the A505, lopping off part of the cat’s tail and substantially altering the boundaries of the ancient grazing land for the first and only time. Students from Cambridge had briefly established a golf course on the Heath years earlier but it was not till 1892 that Royston Golf Club was formed. 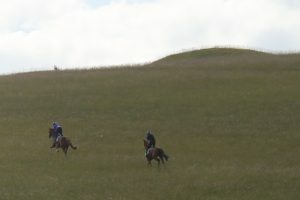 The Conservators now maintain the Heath using money earned from renting out large parts of it to the golf club and the horse-training gallops. 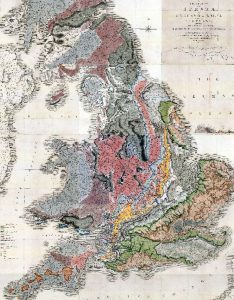 *Published in 1815, it was the first geological map of Britain and the subject of the bestseller The Map that Changed the World. An original hand-coloured map is on display at the Sedgwick Museum, Cambridge and a replica can be seen at the Natural History Museum, London. This entry was posted in Blog and tagged aetheric, anglo-saxon, athelstan, bell eadnoth, bishop of dorchester, canute, chronicle, chronicon abbatiae rameseiensis, church commissioners, cnut, conservators, dane, earthquake, etheric, great map, Henry VIII, hsitory, Katherine Howard, oswald, ransey abbey, royston downs, royston golf club, royston heath, St Paul's, thereuelde, Therfield, Therfield Heath, tumbelow shot, victoria county history, viking, william smith on July 2, 2017 by Graham Palmer. 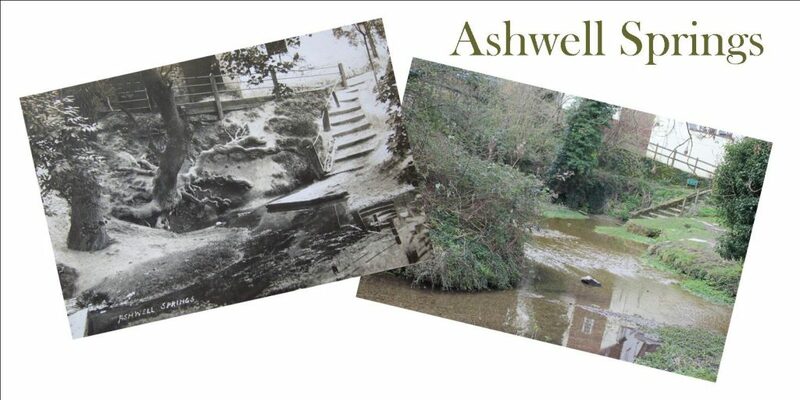 Officially, Ashwell Springs is now a Site of Special Scientific Interest but it has always been of interest to those of a more mystical nature. 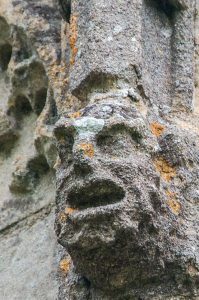 Coupled with the ash (a sacred tree that linked the waters of the lower world with our own world and the sky above), the springhead has fascinated us for millennia. It was not so long ago that such springs and ponds were considered sacred and were even, on occasions, known to yield treasure (old votive offerings from long dead people to the water-giving spirit or god). Perhaps this is why the shallow dew pond (now vanished) which watered animals at the foot of nearby Therfield Heath was once known as the Golden Bog. No treasure survives there now, just a patch of dry nettles thriving on soil enriched with the manure and sediment from the pond’s bottom. But mysteries are still unearthed. In 2002, some distance northwest of Ashwell’s wellhead near the bank of the Rhee, a metal-detectorist called Alan Meek was sweeping a field at Ashwell End when he came across an extraordinary cache of metal objects that had been hidden in the ground over sixteen hundred years ago. 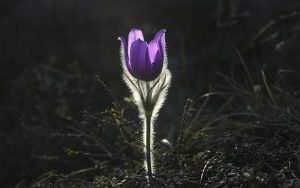 It proved a spectacular rebirth as nearly thirty offerings to a previously-forgotten Celtic goddess appeared from the soil. Many were marked with the name Senuna and there was also a shattered silver figurine of the goddess herself. There are various mother goddesses known to be associated with springs but little survives of Celtic Senuna. Many of the offerings from Ashwell End show her accompanied by an owl and armed with a spear and shield, suggesting that when the Romans invaded Britain they may have assimilated her into the cult of Minerva. 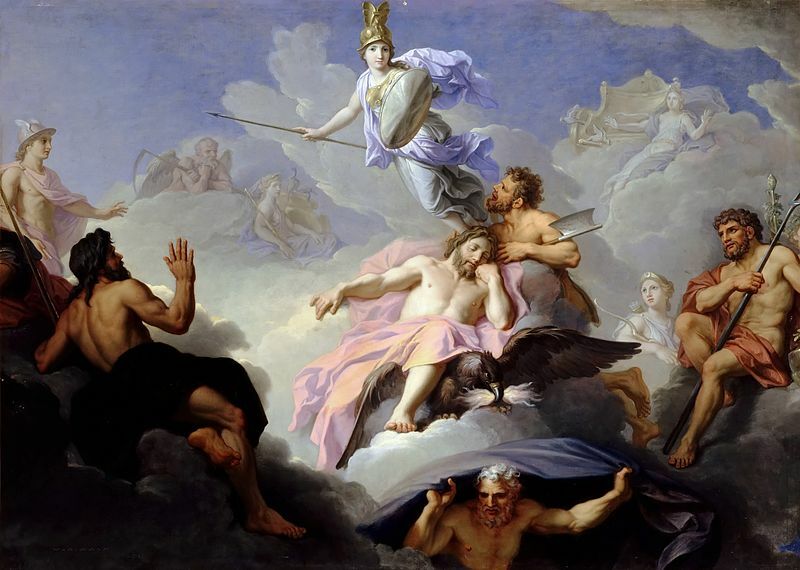 At that time, as Julius Caesar noted in Commentarii de Bello Gallico, the worship of Minerva (or her native equivalents) was prevalent in the Celtic continental heartland of Gaul. Minerva was the Roman goddess of water, healing, warfare, crafts and wisdom and was usually depicted with a sacred owl, a symbol of wisdom but also a harbinger of death. This Roman goddess had a penchant for creative destruction which stemmed back to her strange birth. She had been born from the union of Jupiter (the sky-father who carried a thunderbolt) and a female titan. When the titaness fell pregnant the prospective father was not overjoyed because it had been prophesied that his own child would eventually overthrow him. His solution was to swallow his lover whole before she could give birth. Trapped inside Jupiter, the titaness set about forging weapons and armour for her soon-to-be-born daughter. The stress and the racket of his ex-lover’s new hobby gave Jupiter such a migraine that he persuaded Vulcan to split his head open with a hammer and, lo-and-behold, out of the cleft jumped Minerva, fully-grown and armed to the teeth. But Minerva was destined to become a goddess of wisdom as well as war, so she made things up with her father…but that’s another story. So much is buried, hidden deep from us. Who was this Spaniard’s son whose name means to watch over, preserve or save? What was he doing in rural Hertfordshire? What was his vow and why had he made it? History is full of such uncertainty. Trying to break through to some sort of understanding can cause us all sorts of headaches. Just ask Senuna-Minerva. ‘Those who wait’, the first song in Cracked Voices, will revolve around the relationship between Sevandus and Senuna. This entry was posted in Blog and tagged Alan Meek, ashwell, Ashwell End, ashwell museum, British museum, celtic goddess, Commentarii de Bello Gallico, Minerva, Ravenna Cosmography, Senuna, servandus, the golden bog, Therfield Heath, those who wait, treasure on June 18, 2017 by Graham Palmer. The second song in the cycle is Three Riddles – effectively three art songs in one. As each section has its own riddle attached, I felt it necessary to consider a separate musical riddle to attach to each section too. Keep your ears peeled for this appearing in a clarinet part sometime in March 2018! There’ll also be another bizarre reference in the third of the Three Riddles..
Often a piece will use a section of the circle of fifths, or modulate one way or the other. In my organ piece Circular Musings I modulated through the whole circle in one piece, in four/eight bar chunks. For the riddle, I wanted some accompaniment to juxtapose a section of text talking about footing being sound, trembling foundations and rebuilding. When you only take one or two steps along the circle of fifths, it can sound very strong, but to continue moving round it continuously can feel a little unsettling until the music pauses and grows some roots. As to what the right hand and baritone are up to at the time.. you’ll have to wait and see! This entry was posted in Blog on May 30, 2017 by Jenni Pinnock. That first scribble or tentative tap of the keys can be the most difficult. What if there’s nothing to say? Or, if there is, what if I just can’t say it? Sometimes you just have to face your fear down. Sometimes you just have to write. Get over it – it’s not life or death! What you write may not be any good – it almost certainly won’t correspond to the beautifully-crafted phrases in your head. Quite frankly, it will probably be rubbish. But as someone else said, you can always edit a bad page – you can’t edit a blank one. 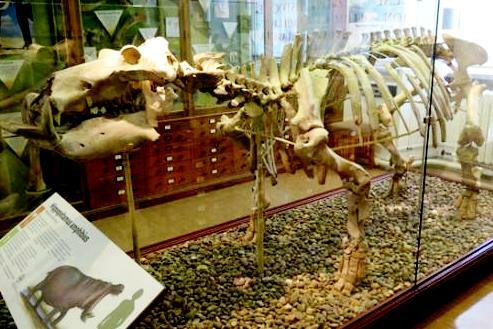 In the Sedgwick Museum in Cambridge there’s the skeleton of a hippopotamus that was dug up at Barrington. (I know this because we chanced upon it there when my kids were small. I’d taken them into the museum to see the dinosaurs.) It was discovered during the Coprolite mining rush that swept across south Cambridgeshire in the 1860s and 70s. Both the hippo and the diggers are now largely forgotten. Apart from the obvious, there must be something deeper that linked this hippo to the fate of the men who mined the ground. These people needed their story digging up! A search on Google threw up the works of Bernard O’Connor who has written extensively on the coprolite quarries (along the way rediscovering the words of a folksong written at the pits in the 1870s by one of the diggers), Royston Museum came up with a copy of Richard Grove’s book from 1976 and a search through the British Newspaper Archive came up with name upon name of men who had been killed digging out the fossils. It was shocking to read how so many men were crushed to death, quite literally buried alive. Further research in the censuses showed that it was not unknown – probably out of economic necessity – for the widow of a digger to marry one of his workmates. Louisa Seabourne at Bassingbourn thus became Louisa Sell and then Louisa Starr. It was about this time that the Sedgwick Museum came back to me with some serendipitous news. The hippo was not a hippo at all. Bones from several hippos had been stuck together. This was a composite animal. On a walk it came to me that this should be a two voice poem. One voice should be that of a dead coprolite digger (based around the skeleton of the folk-song) and the other that of his wife or lover. The fossiler would sing for all the dead diggers and give them a composite voice. The novelist Tim Winton (two-times Booker Prize nominee and four times winner of the Miles Franklin Award) refuses to type, claiming typed drafts look too much like the finished thing and fool you into thinking you’re done when you’re not. Instead he writes the old fashioned way in order to slow himself down enough for the idealised words in his head to translate into real words on the page, not with a pen but with a pencil. The marks a pencil makes are more tentative, easier to cross out or erase. I do both interchangeably…tending towards the computer as the final few drafts emerge…and one of the things I have learned, is not to be too precious. 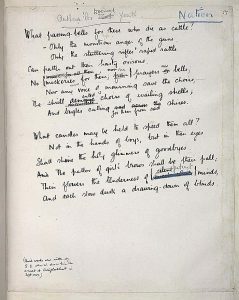 Just look at the drafts of Wilfred Owen’s poems, with Siegfried Sassoon’s scribbled alterations. Sometimes the writer is too close to the original. Sometimes two heads are better than one. My initial plan for this poem was to echo the form of the original folk-song (which has a young man thumbing his nose at his previous employer) but also make it a conversation between two people who aren’t really listening to each other…a sort of delayed call and response. Once I had it nearly finished, I shared a draft with my nearest and dearest as I had niggling doubts – it was not quite there. My son was to the point, ‘The first bit feels a bit like a middle class parody of a folk song!’ He was right. Despite being only slightly altered from the original nineteenth century song, it didn’t feel authentic. I went back and rewrote it (still not right) and then sent it winging through the ether to Jenni. ‘I know it’s a duet,’ she replied. ‘One thought that immediately popped into my head was to make the male and female parts work together, so the last two stanzas could be repeated together – what do you think?’ I looked again. Whether she knew it or not she had hit the nail squarely on the head. It was not just the last two stanzas that needed to work together…it was the complete thing. By cutting up the two monologues and pasting them together it became a dialogue with some unusual linking. Instead of a parody it had become a modern composite and somehow, along the way, the blank paper had spawned a poem. Job done. 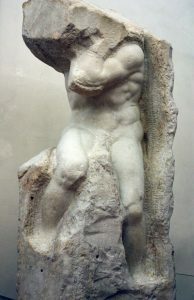 This entry was posted in Blog and tagged Barrington Hippo, Bassingbourn, composite man, coprolite, drafting, Farmers Manure Company, hippopotamus, Lousia sell, Michelangelo, two heads, writing process on May 13, 2017 by Graham Palmer. If you believe some blogs, the cat was first killed at the turn of the 20th century. Wikipedia claims that the saying first appeared in print in 1873 but a brief search of the British Newspaper Archive reveals it was in common usage in Ireland well before that. So what does that prove? Not a lot. Just that you shouldn’t take things you read at face value (not even this)…and that’s the most important thing any would-be researcher can learn. A lot of what we take for granted about the past is – well – alternative facts. It’s not so much fake news as misremembered myths. Just as in the children’s game of Chinese Whispers, the history that gets passed on subtly alters with each retelling. By the time we finally hear the story it has little resemblance to the one that was first told but that doesn’t make it essentially untrue. 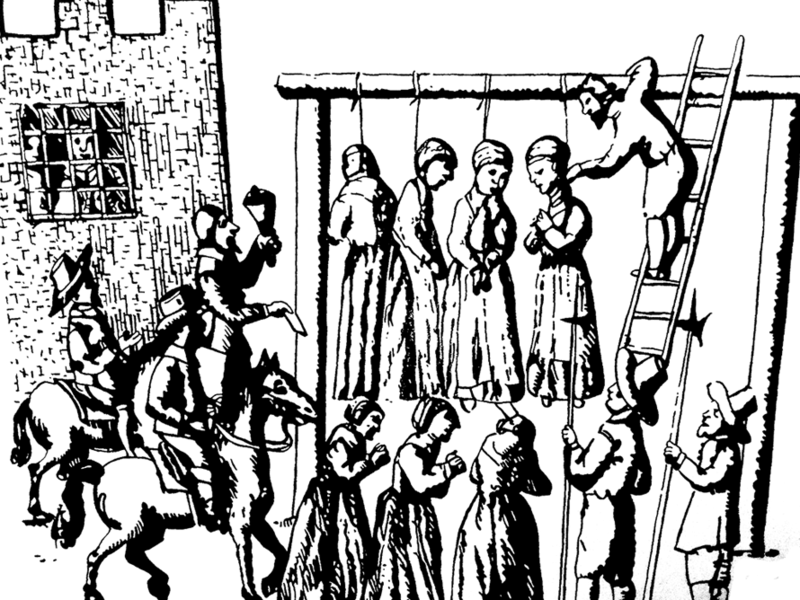 Take the Royston witches. 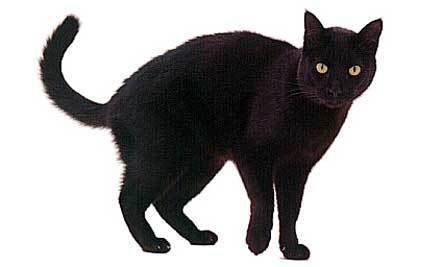 As far as I know, they didn’t have a black cat, nor did they boil up animals in a large cauldron or fly through the air. Since I rediscovered them for Creative Royston in 2014, this however has become the dominant picture people have of them, largely due to an image created for an art trail at the time. Let’s return to the whisper I first heard in 2014. I had not set out to search for witches. I was looking for something else entirely when I came across a reference to Royston in a book. That book (Witchcraft in England, 1558-1618) reprints part of a pamphlet from 1606 called The most cruell and bloody murther committed by an Inkeeper’s Wife… A copy of the original pamphlet is held at the British Library in Euston and anyone can access the original there (for anyone interested, it’s also transcribed here). Like so many other cheap chapbooks, it was not printed to provide an accurate report of recent happenings but rather to ensure they were sensationalised in a way that would confirm the readers’ prejudices, increase sales and make the publisher and street-sellers a fast buck. After dealing with the Hatfield murderers, the pamphlet goes on to tell another story – that of Joan Harrison and her daughter, two women from Royston who were executed for witchcraft that August. Or does it? The chapbook is full of accusations and intriguing detail but gets the basic facts wrong. Its writer may not even have been in Hertford for the Assizes but possibly only heard the story second hand. If you trawl through the court records held at the National Archive in Kew you can go back to that first whisper. In the indictments for the Hertford Summer Sessions (NA, ASSI 35/48/2)* the Royston women are named as Alice Stokes and Christiana Stokes, not mother and daughter but both spinsters (possibly sisters). So how much else in the pamphlet is actually accurate? And why were Alice and Christina suddenly singled out in 1606? 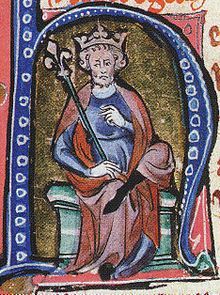 King James of Scotland had come to the English throne only three years earlier. On his journey south he had stopped in Royston and taken note of the good hunting to be had on the extensive heathlands. This was a man who was fascinated with witchcraft, who had previously written a book on it called Daemonologie. This was the year of Shakespeare’s new play Macbeth – where witches haunt the heath – and, apart from hunting, James himself also participated in a number of witch-trials. The king had recently established a bachelor pad in Royston, so what could be more politic for the locals than to furnish him with two women to hang? Of course, this is all pure speculation as no contemporary account has been found to support or refute it. That’s the problem with history. It’s a bit like Schrödinger’s cat. Sometimes you think you’ve got it and then you find out you haven’t! Are you still curious? Is that cat still breathing? Why don’t you do your own digging and try to prove me wrong? How reliable is this account? Was it written by an eye-witness? Was it written at the time? Did the author really understand what they were writing about? Why was it written? Was it just to make money or to curry favour? Was it meant to persuade people of something? Who was it written for? Was it for public consumption? Was it intended to be read at all? What was the context? How does it fit in with what was happening at the time? Do the words still mean the same thing? Can you find anything that backs it up? Do other primary sources support your interpretation? 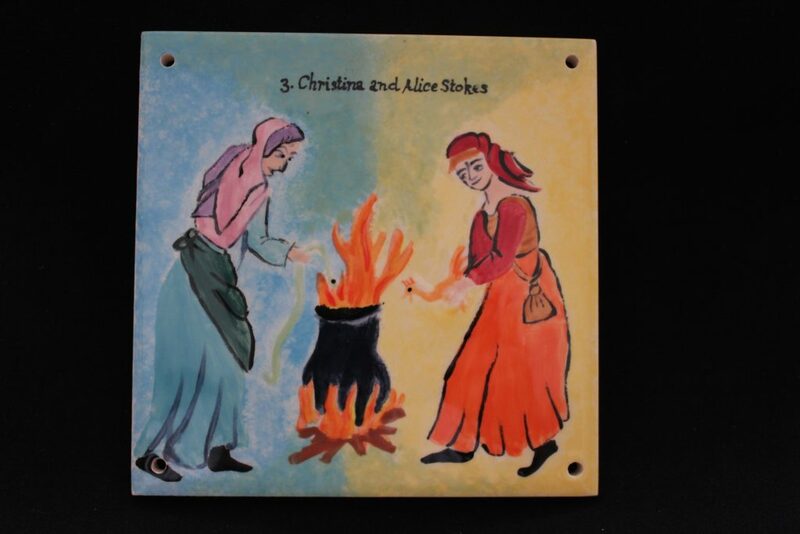 This entry was posted in Blog and tagged 'alice stokes', 'Christiana Stokes', 'Joan harrison', cat, curiosity, research, Royston, witches on May 1, 2017 by Graham Palmer. Word painting – the musical Easter egg! Computer programmes and video games often include Easter eggs – little intentional secrets, inside messages or secrets to be found by the users and players. I’ve always thought of word painting (in the musical sense!) somewhat in the same way. When related to text, word painting is all about the use of highly descriptive words to invoke images into the reader’s mind. Musical word painting is the equivalent using notes – Grove Music defines it as “The use of musical gesture(s) in a work with an actual or implied text to reflect, often pictorially, the literal or figurative meaning of a word or phrase”. It can be found across the musical spectrum, though commonly in Renaissance and Baroque music, art songs (aha!) and folk music such as madrigals. Sometimes a motif representing a mood – e.g. grief – may be the basis a whole piece revolves around, and in others it can be a fleeting gesture supporting the text. Some musicians, composers and musicologists shy away from word painting, thinking of it as a bit childish and simplistic. However, I personally think of it more as human nature. Think of a sentence with the word “falling” in it. Say it out loud a few times. Does your intonation rise or fall on that word? It seems to me it falls the majority of the time when I say it – or am I just word painting with my speech too? (I’ve always waxed lyrical about how musical speech is!). I like adding in moments of word painting. I particularly like a phrase where you have a melody established (and potentially expected), and then it varies just slightly because of some decorative word painting. Sometimes listeners pick up on it and sometimes not, but performers (and musicologists!) do. I adore musical analysis, and that side of me loves finding a bit of surreptitious word painting in a piece – so it’s only natural I include some in my own music! Here are a handful of word painting moments from Cracked Voices art songs (so far!). It’s only a brief selection of four – how many more will there be by the time the cycle is complete? All snippets below are taken from the vocal lines. From The devil and the draper – a bit of hopping to begin the chorus! The melody hops up a third then another third, with bouncy staccatos in a rather quirky, bouncy time signature (7 8 being a personal favourite). From Three riddles (no.2) – A falling tree. From Those who wait – shards are spiky staccatos (may turn into staccatissimos, or accented staccatos in the final version) to demonstrate their sharpness. The intervals between the words -voke, you, with and shards are all diminished fourths – a dissonant interval, uncomfortable to sing and commonly referred to as the devil’s interval. The final excerpt is also from Three riddles (no.2) – an earthquake rocking the baritone’s line. Rock this place begins the rocking motion in triplets, followed a couple of bars later by a continuation of the rocking (yet downwards) motion. This entry was posted in Blog on April 16, 2017 by Jenni Pinnock.